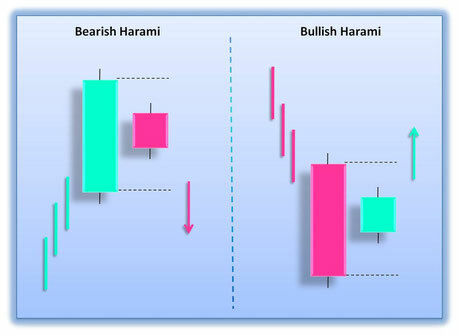 Harami Binary Options strategy It's based on the patterns Bullish harami and bearish Harami. Harami pattern is created by two candlesticks with 2 colour, the 2nd candle of the pattern is more compact and completely contained within a of the previous candle body. I show Harami Binary Strategy also with stochastic filter. Time Frame 4H. 6H, 8H, 12H, daily Time Frame. Expires time recommended Two Bars. Stochastic (4, 1,2,) with smoothed moving average (1, 1). When appears Bullish Harami open buy Call at the open of the third bar. Filter: Stochastic line is > moving average. When appears Bullish Harami open buy Put at the open of the third bar. Filter: Stochastic line is < moving average. In the pictures Harami binary options strategy.